There are absolutely horrible things happening in Israel right now. Whatever you think, whoever’s side you are on, I think we can all agree that war is horrible. In and of itself, it is the opposite of the beauty of the world, the order that is meant to be expressed from within it. War is the opposite of beauty, the opposite of glory, the opposite of good. Yes, it is necessary at times. But we all, except the truly sick, want peace. I’m a supporter of Israel. I’m a supporter of Israel’s war in Gaza right now. I’m also sick and tired of this war, and I want nothing more than to hear that everyone on all sides have laid down their arms, and there will now be eternal peace. 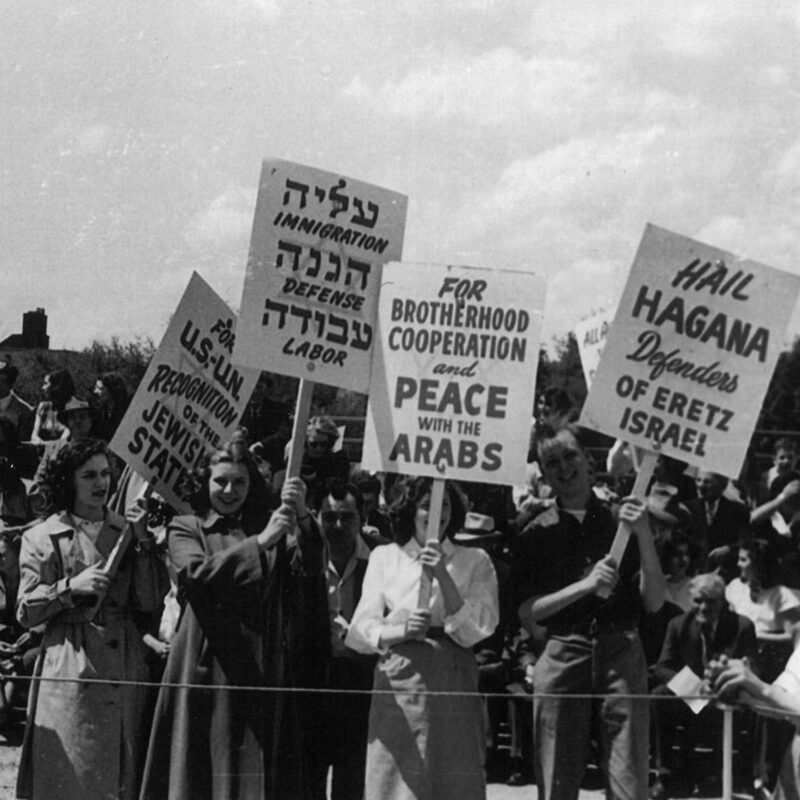 Until then, even during the 9 Days, the saddest period of time on the Jewish Calendar, I’d like to share something I was planning to share during Israeli Independence Day: photos from before, during, and shortly after the creation of Israel. This post is unashamedly pro-Israel, unashamedly biased, unashamedly only showing positive images. Why? Because sometimes we just need to celebrate. We need to understand that there will always be gray and details and items for introspection. But sometimes we just need to celebrate. Sometimes we just need to remember why we’re in this mess and why it matters to us. That’s why I want to make this post today, during a war, during the time Israeli soldiers and Gazan civilians are dying in a war, during the saddest part of the Israeli calendar. A reminder of what we’re fighting for. A reminder of the incredible efforts Jews have made to create their state. A reminder that we love our home, and we will never leave. A reminder that some things are worth fighting, dying, and even killing for. May there be peace today. May we never fight again. May the Palestinians get the sovereignty they deserve. And may the world never forget the value, power, and meaning of a Jewish state of Israel. Tel Aviv was bought by Jews in 1909 from Bedouins. They had grown tired of the congestion of Jaffa, and formed a company which then bought 12 acres of sand dunes. 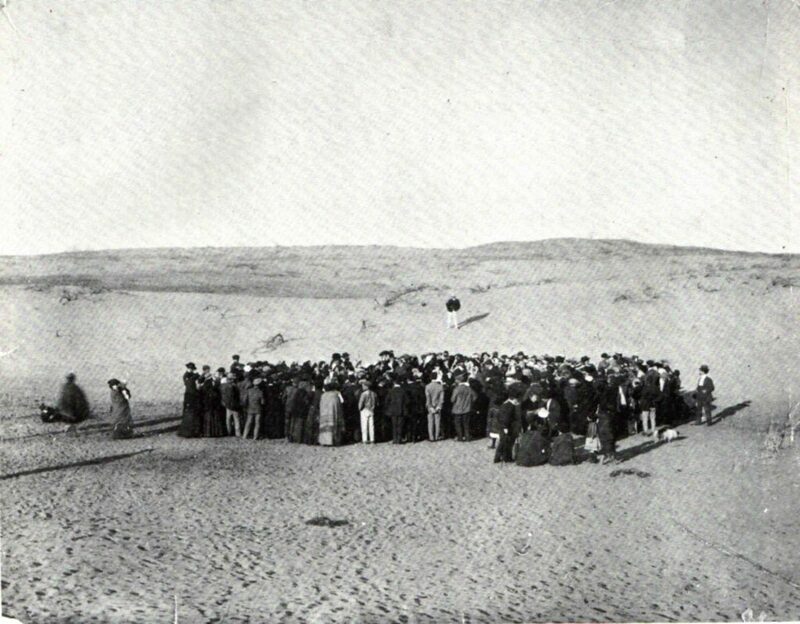 This photograph is of the auction to buy the first lots of land in the newly-formed city. For anyone who has visited Tel Aviv, it is absolutely stunning to see such an image. Only a century ago, completely barren. 11 years later, and this is what some of Tel Aviv looked like. 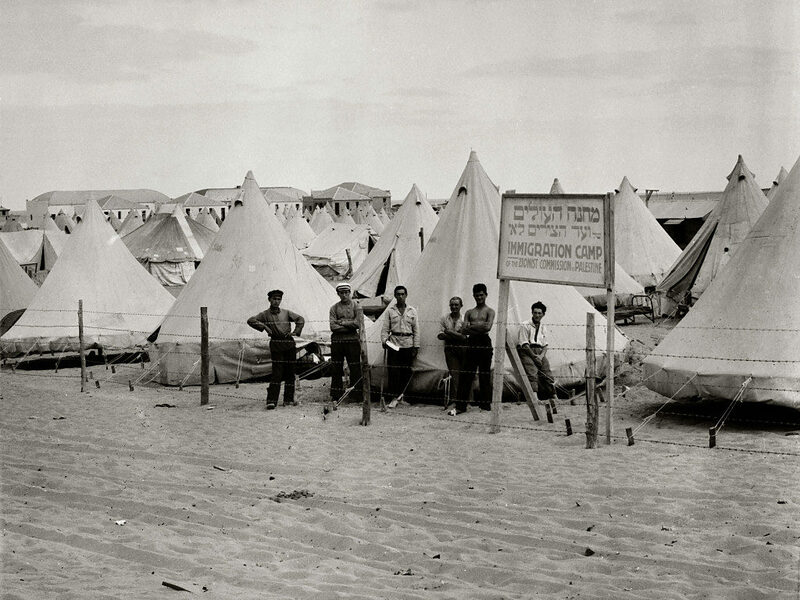 An “immigration camp for Jews”, apparently. I have not been able to find more information, so if anyone does, please share and I will update! 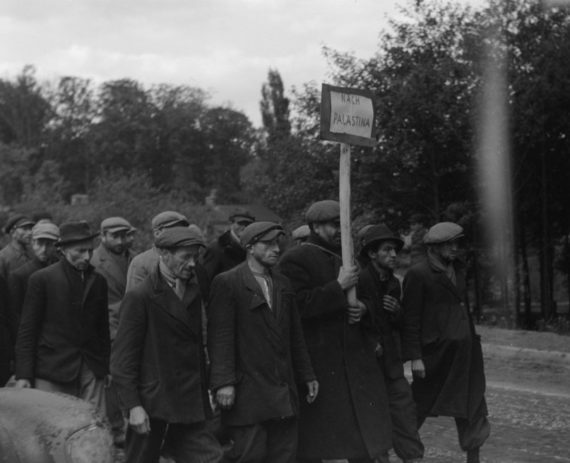 A group of Jews walk down a street in Poland in 1939. The sign says, “To Palestine”. One can only hope that they arrived. 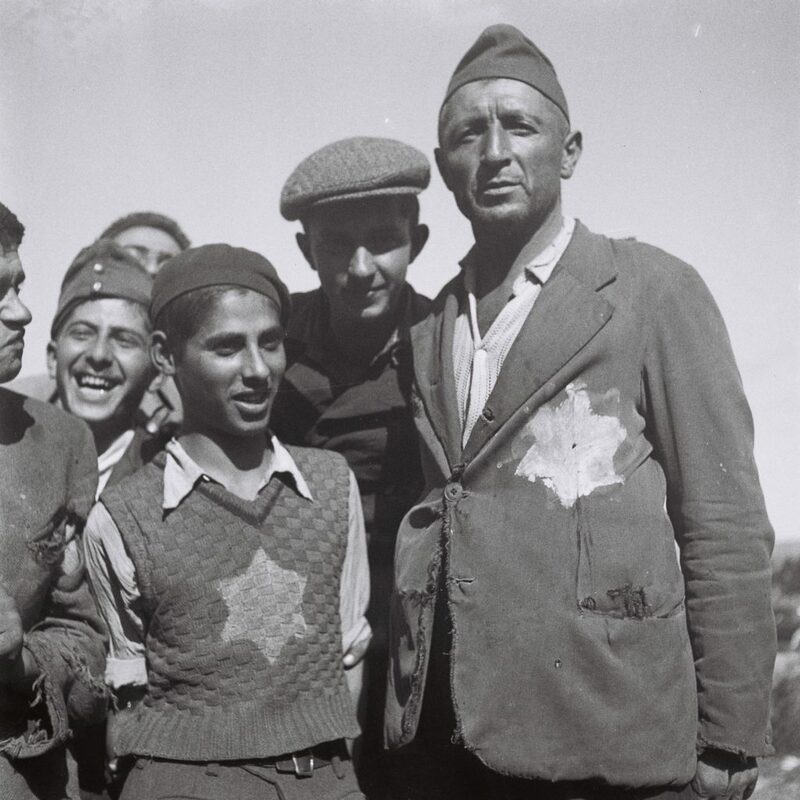 This beautiful image is of a group of Holocaust survivors who were being held at the Atlit detention center south of Haifa. Atlit existed in the 30’s as a way to prevent Jewish refugees from entering Palestine. 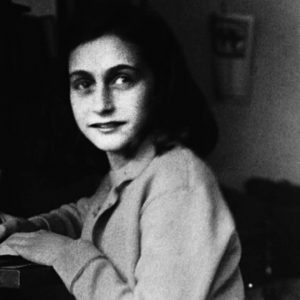 By the 40s most of its inhabitants were Holocaust survivors. 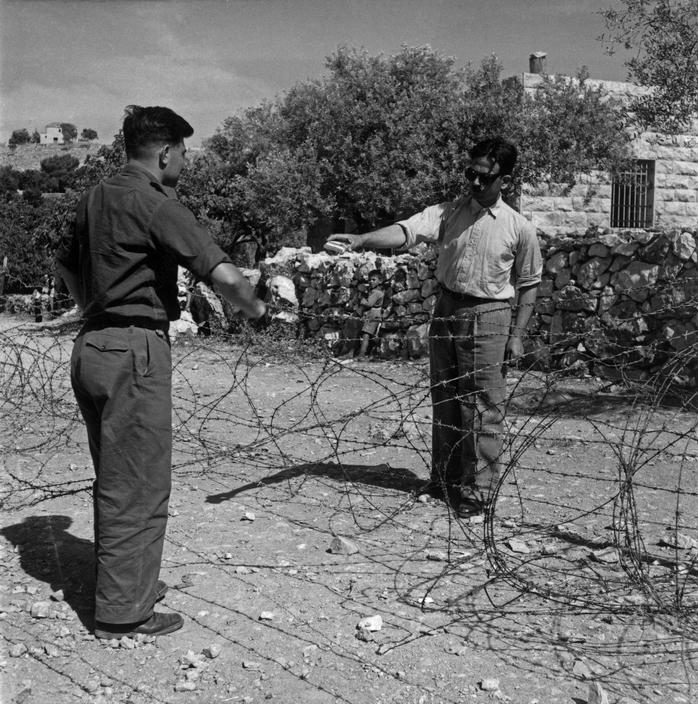 It was subject to raids and escape attempts throughout its existence, and once Israel was created, the prisoners were finally let free. 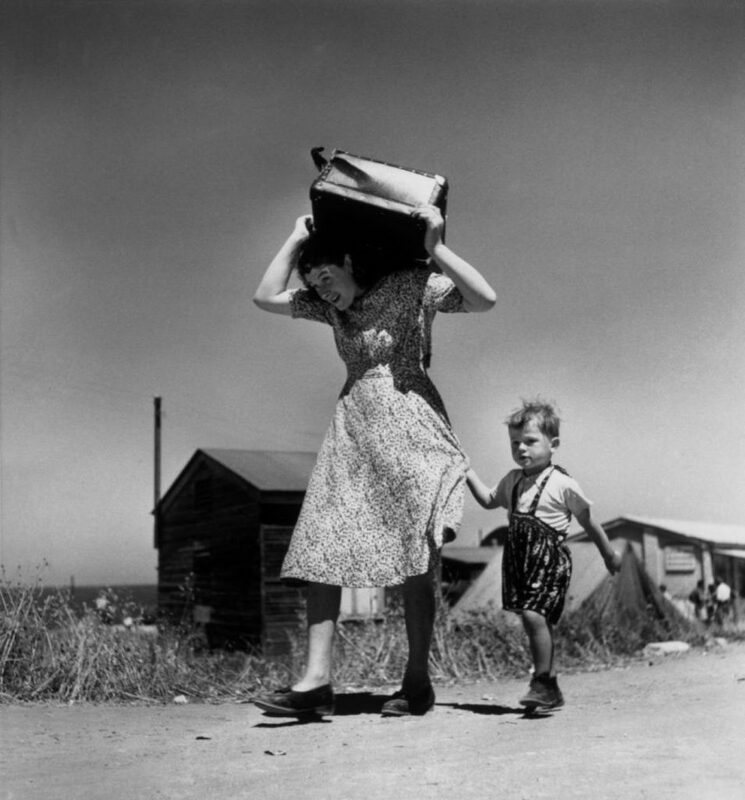 After World War II, the British became extremely nervous about the flood of Jewish refugees entering Palestine. 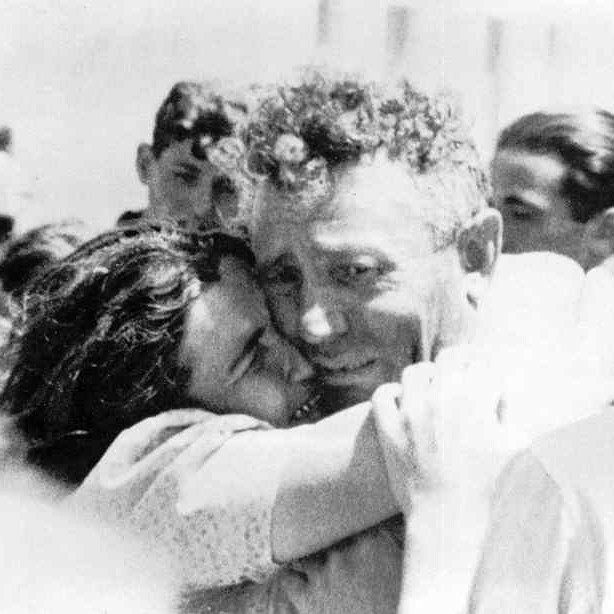 These refugees, feeling unwelcome in any country after the Holocaust, after the United States and others rejected so many of them who attempted to flee, etc, had decided the only place for them was Israel. But the British, fearing tension between Palestinian Arabs and Jews would erupt if not carefully managed, refused to allow more than 1,500 Jews per month. 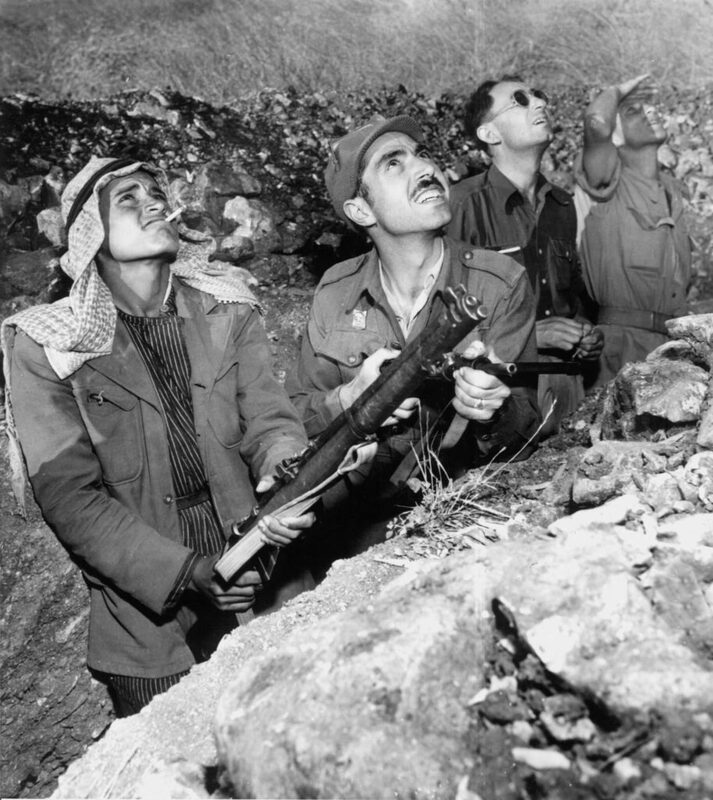 The clashes between the British and the Irgun, among others, are famous and add a complicated chapter to the story of Israel’s creation. But images like this are a reminder of what exactly was being fought for and why. I love this image. I don’t know what’s going on here, or what they’re saying. What matters to me is the look of peace between the two, and the quiet reminder that for many “people on the ground” Palestinians and Jews were friends and neighbors. And they still are. Either way, it is a fascinating image, and shows just how wrinkled and complicated the creation of Israel has been from the beginning. 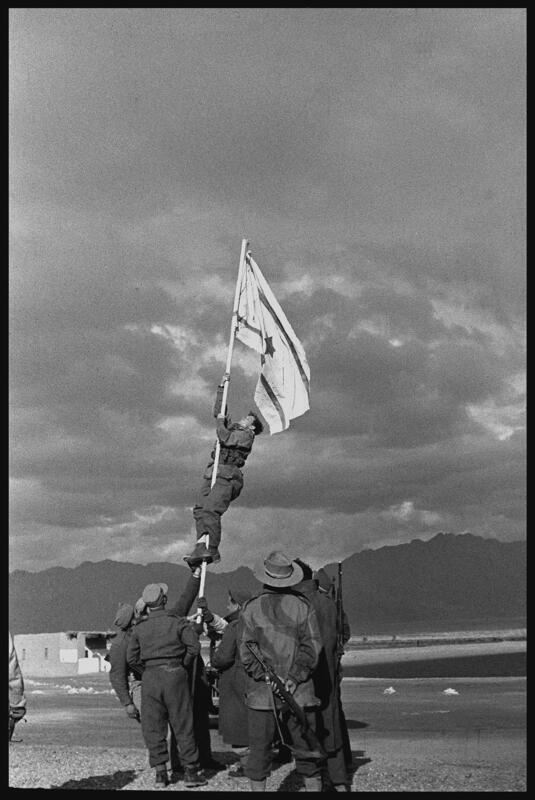 This stunning image has been compared in Israeli circles to the famous photograph of Americans raising the flag in Iwo Jima during World War II. 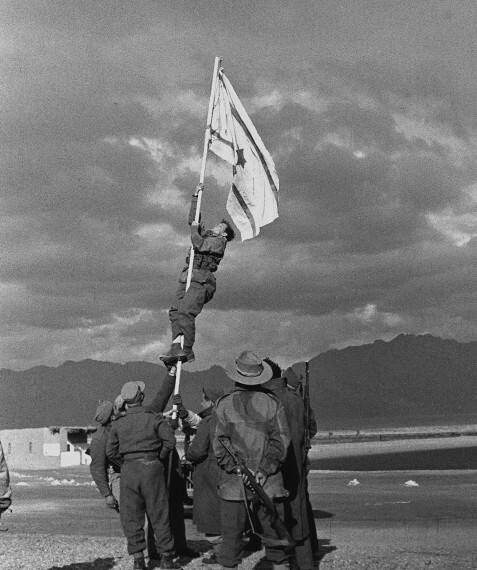 The homemade flag was raised near Eilat during the War of Independence, and represents something heroically beautiful about the people who brought Israel into existence: like the flag, they were now making their country out of scratch. A calm beach-front. 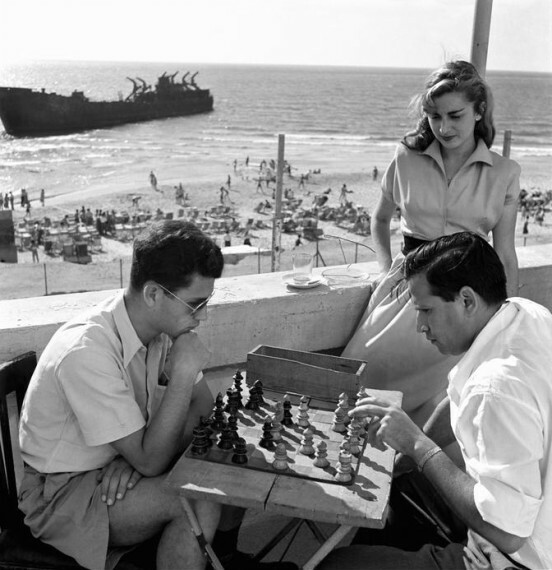 Young men playing chess. Seems like a typical scene in Israel. Until you notice the shipwreck in the background. That ship was the Altalena, a ship of immigrants and arms that led to a violent confrontation… not with Arabs or Palestinians… but between the IDF (Israel’s army) and the Irgun (an Israeli paramilitary group). Ironically, this happened shortly before a planned merging of the groups. 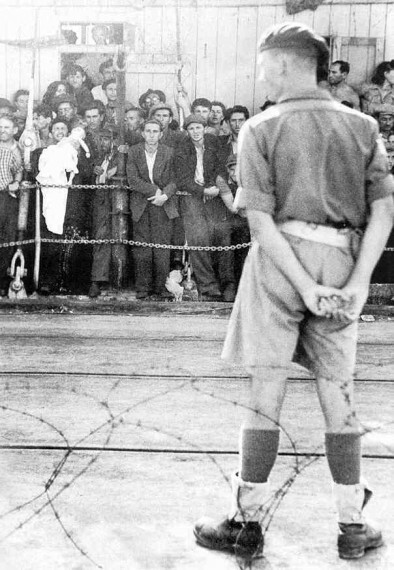 This image, in my mind, is such a perfect representation of Israel, even today. A calm chess game after an insane fight. 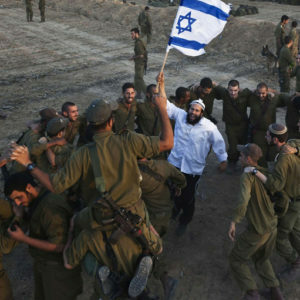 A fight between Israelis, not with the outside. Normalcy in the madness. This is Israel. This is how Israelis can live productive, beautiful lives despite the crazy world they have found themselves in. It’s a beautiful thing to witness. And as we can see, it’s been like that from the beginning. 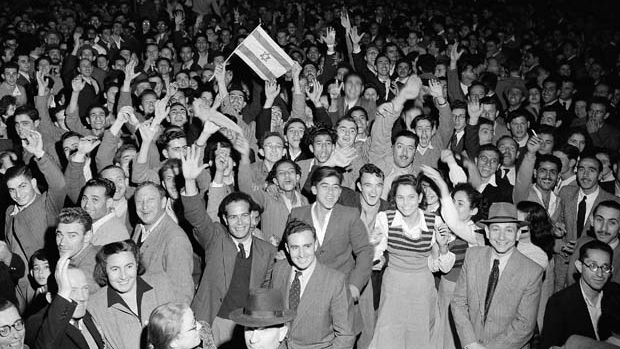 Speaking of joy in their eyes… there is this special aura coming from Israelis photographed in 1947 and 1948. Just beautiful, and a reminder that somehow they were so happy despite all the war, all the disasters… it was worth it. See more photographs like this from LIFE magazine’s amazing set. 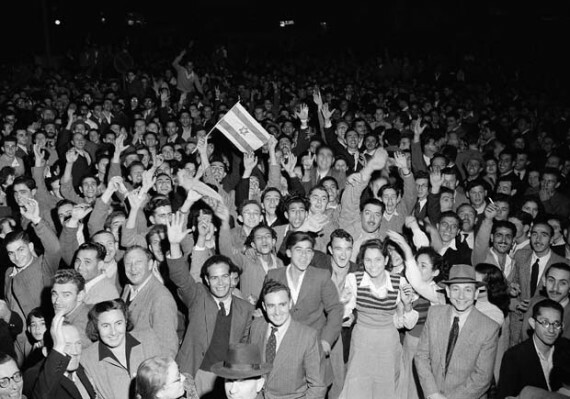 There’s something stunning about seeing the way the diaspora supported the creation of Israel. This photograph was taken shortly after the creation of Israel in Detroit of all places. A rally at a Jewish high school to both celebrate Israel’s creation and stand up for its right to continue existing. 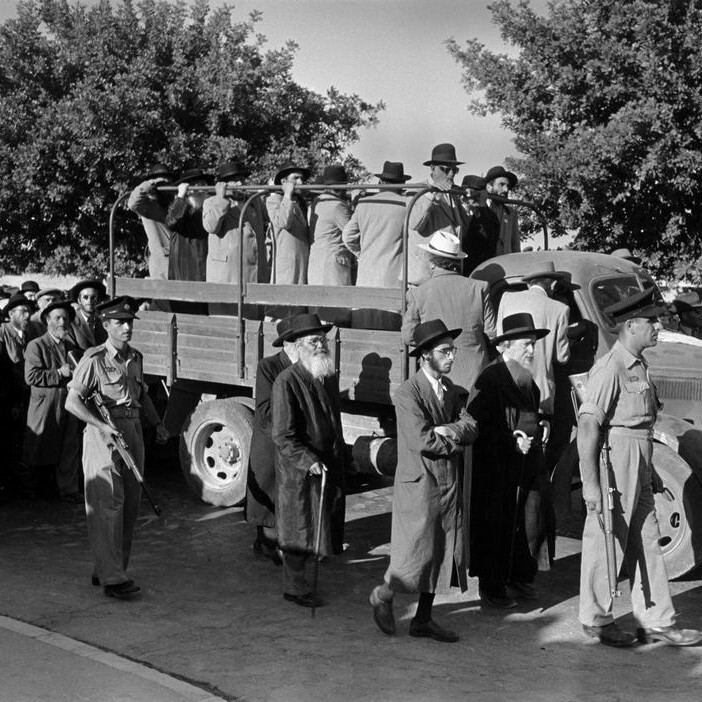 This image depicts a group of Israelis transporting the ashes of concentration camp victims to be buried in Jerusalem. There is really no need to describe the power of such an image. But it is a reminder of just how much this land meant to the Jews after the trauma they had just experienced. This is one of a series of incredible photos by Robert Capa (a few more of which are featured here). See more here. 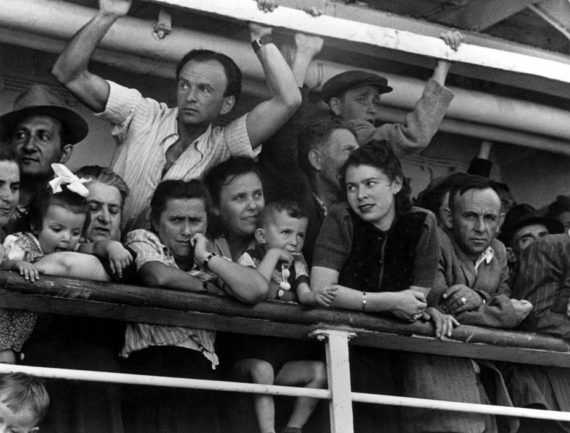 Thousands of Jewish immigrants came in through the Haifa port after Israel was given to the Jews. According to the source, this image is of a group of immigrants from Eastern Europe, Turkey, and Tunisia arriving. I have no clue what this image is actually depicting. Is she moving towns? Did she just arrive in Israel? What I do know is that it is a beautiful depiction of the spirit of Israel, from before its creation to today. 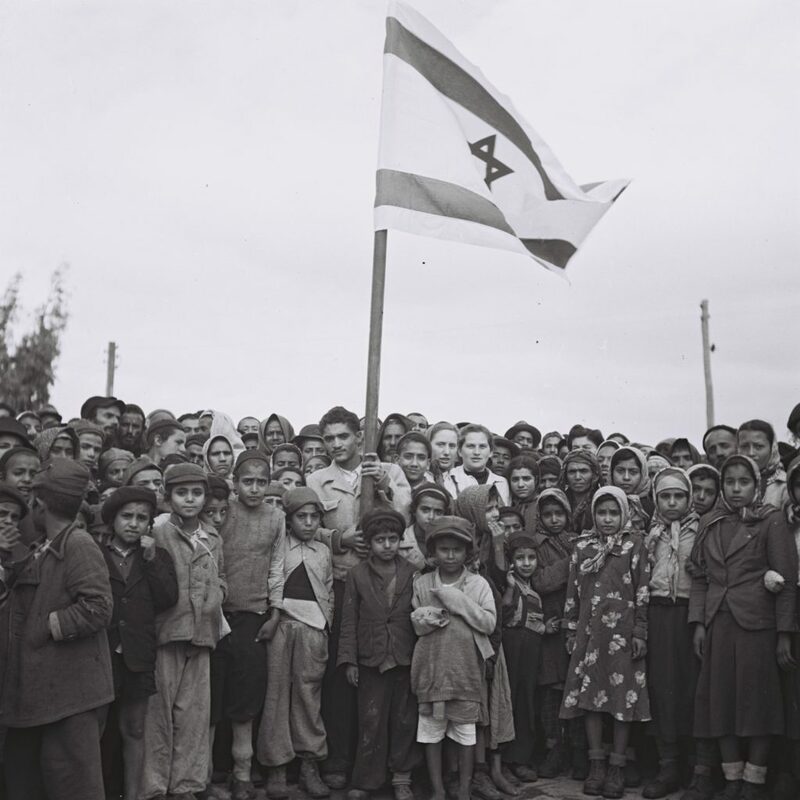 A group of Yemenite children celebrate Tu’Bshvat at the Yemenite immigration camp in Rosh Ha’ayin. 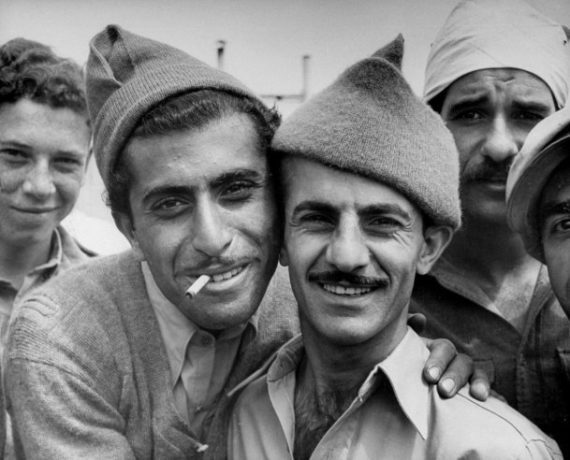 There are a stunning array of pictures from Yemenite camps, and it took me a lot of time to cut them down to the best ones. See more here. 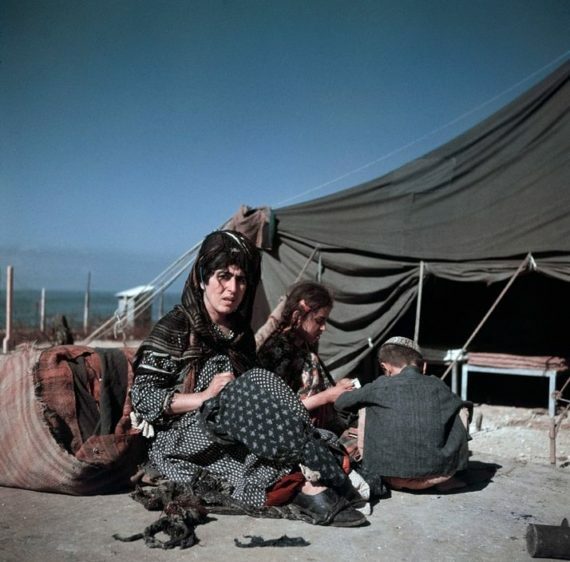 Another Yemenite camp photo. Another incredible photo by Robert Capa. I couldn’t resist, the color just makes this so stunning. This photo and the next… they represent the beauty that Israel is and can continue to be. A place that is distinctly Jewish, but in which anyone can live in peace. Israel represents diversity, rights, and so much more. 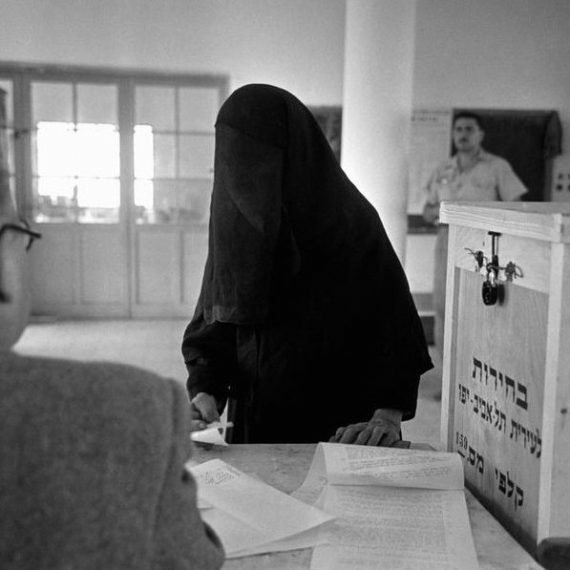 This Bedouin woman voting… what a beautiful image. And how Israel it is. An unidentified village. Divided by barbed wire. Divided between Arabs and Jews. And yet, a handshake. This image, this potential unity, the potential peace, it represents… it is the vision we all have of Israel. Of reaching beyond the incredible divisions, the pain, the deaths… towards a world of true peace. The dream will always live, beyond any war, beyond any conflict. May it come true today. "Why Do They Ask The Impossible Of The Jews?"